AOL has launched a new homepage design – its first major update since 2009 – which aims to highlight video content and offer a “mobile-first” experience. AOL says it has had a 94 per cent year-on-year increase in video views on its site, while unique views from mobile have grown by 79.5 per cent since June 2014 and now totals nearly 40 per cent of its traffic. The new AOL homepage features a “dynamic, video-driven, modular format”, the company says. 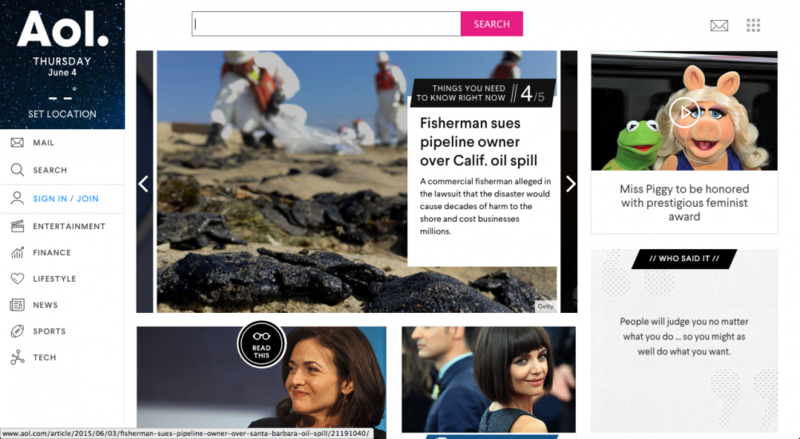 It is the first major update to AOL’s homepage since its Wolff Olins-led rebrand in 2009. This new design is rooted in what AOL calls an “agile programming structure”, which allows content including video to be created and published in a modular format. These replace the news stream layout of the previous AOL site. AOL was bought by telecoms company Verizon last month for $4.4 billion (#2.8 billion).